The Eco Air ECO20LDF Dehumidifier is the larger capacity unit in the Eco Air "F" range of dehumidifiers for use in the home. The ECO20LDF is around 40% more powerful than the ECO14LDF and will operate effectively to dehumidify an area of up to 30m2 (approx.320 sq ft), making it suitable for a large room or a smaller apartment. Although very similar to its smaller "sibling" the ECO20LDF is a slightly larger dehumidifier and is just over 3 kilos heavier. Despite this the unit is still pleasingly small, and of a manageable weight, and well suited for use in areas where floor space is limited. 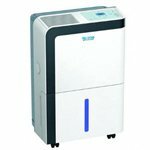 The water extraction rate of the Eco Air ECO20LDF Dehumidifier is 20 litres per day. The figure was obtained at a temperature of 30°C and 80% relative humidity. These are far from typical conditions in the UK but are the conditions that most manufacturers supplying the British market use when rating their dehumidifiers. The amount of moisture removed from the air by a dehumidifier becomes less as temperature and/or relative humidity fall. The quoted figures allow fair comparisons to be made between different products but are not an indication of the amount of water you may expect to see collected in the bucket every 24 hours. In typical conditions the amount is unlikely to be above half the stated figure and may be much less. This is no cause for concern and may simply be an indication that the relative humidity in the room is low and that the dehumidifier is performing well. If this is the case you should also notice that the dehumidifier is switching off for periods of time. If it runs continuously it is almost certainly because the area in which it is placed is too large for the power of the unit. When choosing a dehumidifier it is always wise to pick a unit that is a little larger than you need. Larger dehumidifiers remove more moisture per unit of electricity consumed. If the dehumidifier is of a higher capacity than the room requires it will also run for fewer hours, a double saving on energy. The Eco Air ECO20LDF Dehumidifier incorporates a humidistat, which works like a thermostat, to switch the unit on and off according to the pre-set level of relative humidity. The accuracy of these devices varies and in less expensive machines, such as the Eco Air ECO20LDF, is less likely to be as precise as we might like. It may be useful to check the relative humidity with a hygrometer (like a thermometer by for relative humidity) and regulate the humidistat to achieve the level of RH you need. If you are not sure what level is best here are a couple of thoughts to bear in mind. People are comfortable within a range of 30% to 70% RH. Mold and dust mites, both allergen producers, are unlikely to flourish at or below 50% RH. 50% RH is a good place to aim and will also control condensation, although the glass on your windows may still have a film of moisture in colder weather. Although a little larger than the ECO14LDF the Eco Air ECO20LDF is still pleasingly compact. It stands the same 50.5cm in height and its foot-print is 33,6 x 23 cm, a relatively small increase. The additional weight, at 13.7 Kg will be more apparent but this is quite reasonable for a unit of this capacity and with a carrying handle and castor wheels the ECO20LDF is an entirely portable dehumidifier. The water collection container, or bucket, is a little larger, 3 litres capacity vs. 2.7, but will fill up more quickly than the bucket in the ECO14LDF. This factor may make it more attractive to take advantage of the facility for continuous drainage provided by this unit. A small plastic hose attached to a water outlet on the dehumidifier will run the water to a nearby drain. Please note that the water is drawn by gravity only and raising the unit a few feet above the floor will aid the process considerably. In the event of a power cut the Eco Air ECO20LDF will switch itself back on when the power is restored due to its auto-restart feature. This is particularly helpful if you are away from home for a few days and want to leave the dehumidifier running in your absence. The ambient temperature operating range of the ECO20LDF is 5°C to 35°C. The higher end of this range is unlikely to be a problem in the UK but the lower end should be viewed with caution. Refrigerant dehumidifiers do not operate well in cooler temperatures. Ice forms on the cold coil and the unit has to stop until the ice melts. This will happen at any temperature from about 20°C downward. To operate effectively at low temperature a refrigerant dehumidifier needs an active system to melt the ice, usually a type of "hot gas defrost". Without such a system a dehumidifier in a cold place will be stopped for too many hours per day to be effective. This is not a problem in living areas of most homes but it does mean that we cannot recommend this unit for a garage or any area which may have a consistently low temperature during cold weather. One other consequence of being more powerful than the ECO14LDF is that the Eco Air ECO20LDF is louder, 50dB as opposed to 45dB. This difference will be noticeable but is inevitable. More powerful dehumidifiers are always noisier than less powerful ones. Paradoxically this may also be a reason to prefer the larger machine since in a given area it will run for less hours per day. In defence of this unit it is reasonably quiet for a dehumidifier of its capacity.